I'm experimenting with nosqlBooster for mongodb, it looks promising. I'm trying to establish a connexion to AWS DocumentDB, using a SSH Tunnel. I have to use a certificate provided by AWS. 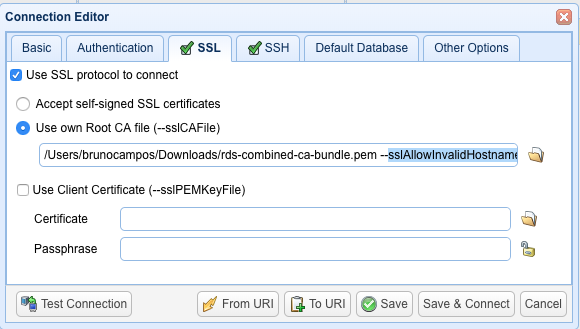 Then the connexion fails with the error " 'localhost' not in the cert's altnames "
If I tick 'Accept self-signed SSLcertificates' instead, it works. Also note thet the 'official' mongo client 'Compass' works fine. Looks like 'locahost' should be trusted by default when using a ssh tunnel. "Hostname/IP does not match certificate's altnames. Host : localhost is not in the cert's altnames"
is there any support for this ? We have worked out a new test build to add sslAllowInvalidHostnames option. Please download and try it again.